Doctors from the Melbourne Stem Cell Center are using stem cells to regrow damaged knee cartilage. Over 70 patients have had their own isolated and expanded mesenchymal stem cells (MSCs) injected into their own knee joints. In initial results, half of those treated at Melbourne Stem Cell Center saw a three-quarters reduction in pain and vastly improved knee function. 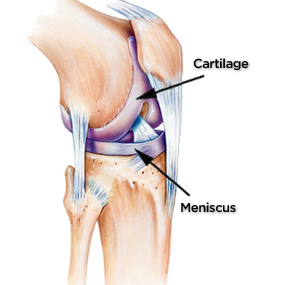 Meniscus Regenerative Therapy Engages Patient’s Own Stem Cells. In a newly published article by the Wall Street Journal, a team of Columbia and Cornell researchers led by Dr. Jeremy Mao [a member of StemSave’s Scientific Advisory Council] has developed a potential method to treat patients with torn menisci. The method involves 3D-printing a biodegradable scaffold of the meniscus, infusing it with growth factors, and implanting it into the knee. Once in the patient’s body, the growth factors should attract autologous [the patient’s own] stem cells to generate a new, natural meniscus. Epibone creates precisely measured scaffolding for stem cells to recreate damaged bone. The New York-based startup Epibone intends to begin human testing on a procedure that will utilize stem cells to regenerate living bone tissue. The researchers, originally from Columbia University, will apply autologous [the patient’s own] stem cells to nanofiber scaffolding of the desired size and shape and direct the stem cells to differentiate into a physical and genetic replica of the patient’s own bone. The transplantation of stem cells into areas affected by osteoarthritis allow lost cartilage tissue to regenerate. In recent clinical trials, researchers at the National University of Ireland Galway have successfully utilized adult stem cells to treat patients with osteoarthritis. The treatment involves recovering the patients’ own [autologous] stem cells and then injecting the stem cells into cartilage to stimulate the regeneration of lost tissue. Hip Replacement Procedure Utilizes Autologous Stem Cells. Scientists have utilized stem cells to aid in artificial hip replacement. Doctors and Scientist at the Southampton General Hospital have successfully completed a hip transplant by using a titanium socket and a bone scaffold loaded with skeletal stem cells. The team, led by orthopedic surgeon Douglas Dunlap, 3D printed the titanium implant, and then added the bone graft filled with stem cells to the pelvis to encourage bone regrowth behind and around the metal replacement. Leg Injuries Healed With Patient’s Stem Cell Therapy. A new stem cell therapy allows patients to regrow leg muscle after traumatic injuries. A research team led by Stephen Badylak at the University of Pittsburgh has used the patient’s own stem cells to help them recover from injuries in which over 50% of their leg muscle was lost. First, they implanted a biological scaffold into the wound. Then, the patients underwent aggressive physical therapy, which directed the recruitment of stem cells to the site of injury to rebuild properly aligned muscle tissue. By the end of the treatment, patients exhibited muscle regrowth and at least a 20% increase in leg strength. Stem Cells could make knee cartilage repair more convenient and 75% less expensive. Researchers in the Netherlands at UMC Utrecht have developed a method to combine two chondrocyte knee repair surgeries into one using mesenchymal stem cells (MSCs). The new procedure takes chondrocytes (cells found in cartilage) from the patient, mixes them with specialized MSCs, and then implants them back into the damaged area of the knee. The stem cells help regenerate the cartilage, while the patient’s own cells avoid an immune response when implanting the mixture. Researchers in the Biomedical Engineering Department at Columbia University have developed a methodology utilizing mesenchymal stem cells [the type of stem cells found in teeth] to engineer fibroblast tissue in the ACL. The stem cells were treated with both chemical growth factors and mechanical factors [scaffolding and mechanical stimuli], which enhanced the regeneration of connective tissue. Arthritis affects 44 million individuals in the US resulting in the need for approximately 700,000 knee-replacement and 100,000 hip replacement surgeries every year. Researchers at Stanford University have developed a technique to track the effectiveness of mesenchymal stem cells [the type of stem cells found in teeth] in repairing arthritic joints. Mesenchymal stem cells are capable of differentiating into bone and cartilage, as well as muscle, fat and tendon. The researchers expect to adapt the study for clinical trials in humans this fall.